It’s hard to believe that only 48 hours ago I was standing 3km higher. On the summit of Mount Everest, where the air thins to a third of what we breath at sea-level, everything seemed to pale into insignificance. It’s hard to remember many other instances when I felt more in the moment, more grateful, more fulfilled; at peace. After 12 years of dreaming, 2 years of intensive training before the expedition and 2 months on the mountain, I had still managed to make the most crucial mistake of all, thinking the worst was behind me. And the mountain always had a way of teaching me life’s lessons, the hard way. Ben and Tori had gone up to make their own dreams happen, after a mean stomach bug had thwarted their attempt to summit with Greg and I. Descending from Camp 2 I met with the duo for a brief hour at Camp 1. It was just long enough to share a brew and get out of the midday sun, then they were off on their mission and I was alone. Faring better on the descent, the remainder of my team were already safe at Base Camp. 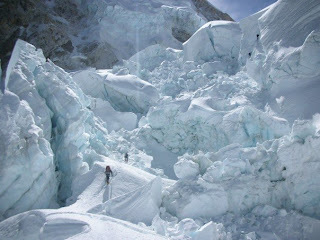 Now it was my turn to go through the Khumbu Ice-Fall one last time to safety. Despite it being notoriously known as the most dangerous part of the mountain, I’d somehow grown accustomed to its objective hazards; crevasses, falling ice-block, avalanches and other charming events. This time was different though. We were fast approaching the hot monsoon season and everything had began to melt leaving a very different mountain to the one we had climbed only days before. The ice-fall would make sure that this last rendevouz was decidedly memorable! I was safely half-way through the icy labyrinth when I walked to the precipice of this one crevasse. For some reason, it felt more terrifying than all the rest. It wasn’t so much that it was wide enough to sink a small house or deep enough that all I could see was its black seemingly bottomless pit, there was something else I could not quite grasp. The weather had been getting progressively worse for a couple of hours and now the mist had descended so much that I could barely see my own hands when I held them in front of me. As the 3 flimsily connected aluminum ladders lay precariously at a 45 degree angle over the gaping hole, I could not help but notice how it clattered on the glacier floor from the increasing winds. Usually they’d just bend slightly under our weight but this one was going into a fit of its own. I was already terrified when I became suddenly aware of my palms heavily perspiring inside my insulated gloves. This realization seemed to accentuate this feeling. My buff wrapped tighter around my neck and I began taking deep forced breaths, almost willing my heart to slow down. The harder I did, the harder my heart pounded until I could actually hear it. I could not feel the cold anymore. I remember there being a heightened sense of realization that this was about to become a defining moment; that I would describe incidences from then on as ones who had occurred before or after it. I took the first step onto the ladder, stepping away from the safety of the ledge. The metallic crampons attached to my boot hit the ladder producing a sound so persistent that it seemed to echo around me. The ladder shook violently and its tilt made staying balanced a challenge. Instead of being totally fixated on my feet, I found myself distracted by the black labyrinth that lay beneath and how the myst became so dense that it seemed to blend into the darkness below. The Sherpas’ joke of climbers falling all the way down to America in such crevasses didn’t seem funny anymore; this is when you panic I thought. 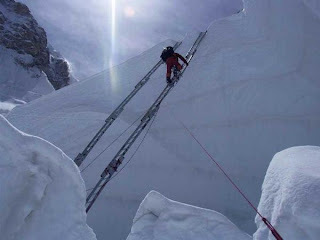 Before I could fathom the profoundness, or lack thereof, of this realization, my crampon front points jammed into the aluminium ladder a fraction of a second longer than it should have, hurling me forward and down. I don’t want to die I thought. Even people who want to go to heaven, don’t want to die to get there. The irony in falling to my death minutes before safety is so cliche that it’s hard to believe any other scenario is feasible. I’m so far behind that if I shout, the winds will drown my voice. I fell to my knees so hard that I almost banged my head into the ladder, then I began to fall sideways so slowly that it seems deliberate and fake. In one final, it now seems overly dramatic moment, I extended my arm and grabbed the ladder step with the tip of my two longest fingers and pulled myself just enough to be able to clench the whole thing with my fist. Slowly, I gathered myself back into a kneeling position and began to stand up. When I finally became upright once more, my knees were shaking. I looked across and realized I had gained a few inches on account of my set back and was now only one big step from safety. I took a deep breath, looked ever so slightly at the heavens and jumped across. I’d made it and with that came the realization that only minutes from now the celebrations would begin and never again would I be back to that same world, during that same era, feeling the same things. My heart sank but I managed a smile. Finally before walking to safety, I turned back one last time, closed my eyes and committed the experience to memory. Your blog was fascinating to read. Though it’s about 3 yrs old but it still gives any reader goose bumps. Your experience and Everest triumph will surely last a lifetime. My research team recommended me to read your blog and it was indeed a worthwhile. The reason I am writing you this mail is for http://www.upeverst.com . This soon to be launched website in about 2 months is going to be dedicated to Everest. The sole objective would be to provide up to date information, articles, blogs, important tips, history, facts, records, trekking, climbing, and expeditions. 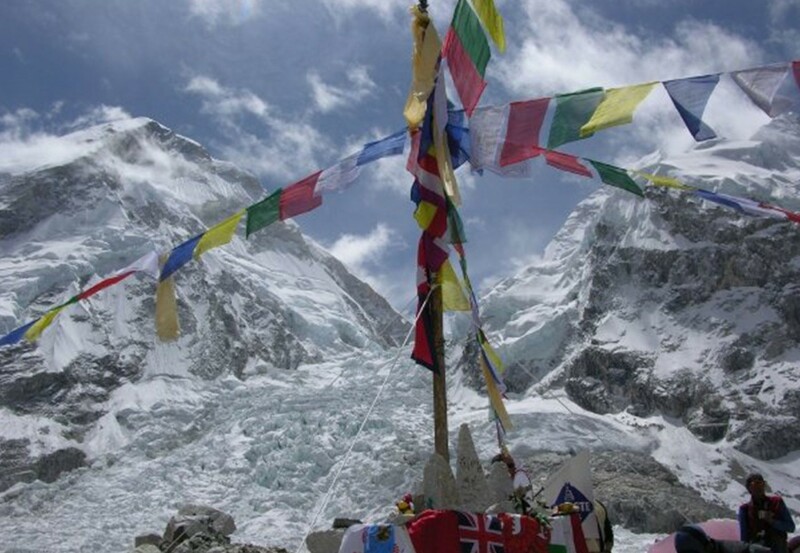 With our tagline – ‘Everything about Everest’, we look forward to provide maximum possible and updated information about Everest through this website. 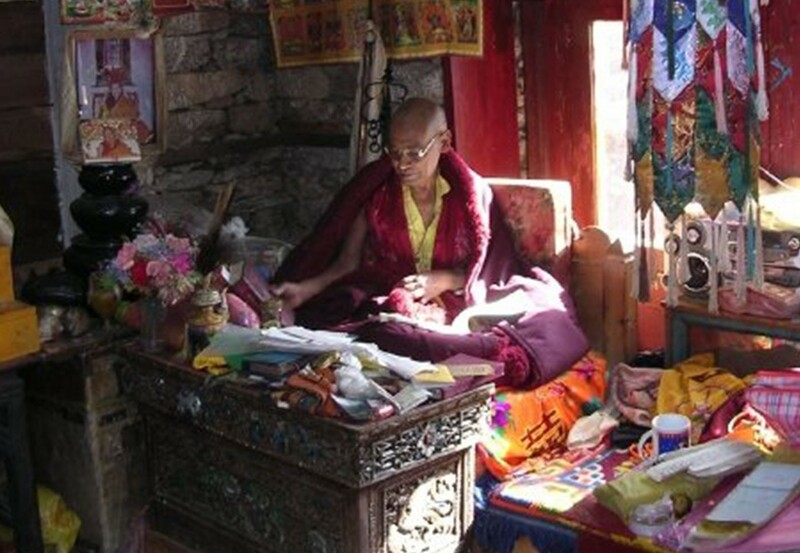 I want to request you to allow us to use your story in our Everest experience section. It would be fascinating reading to our readers. Since we are investing lot of resources through Search Engine Optimization, am sure your story will reach to broader audience and will inspire other adventure lovers and Everest enthusiast. Please note, all the due credit and your picture will be published along with your contact details in our platform. Many thanks for your comment and for stopping by! A response to your query will be reverted back to you as soon as possible.